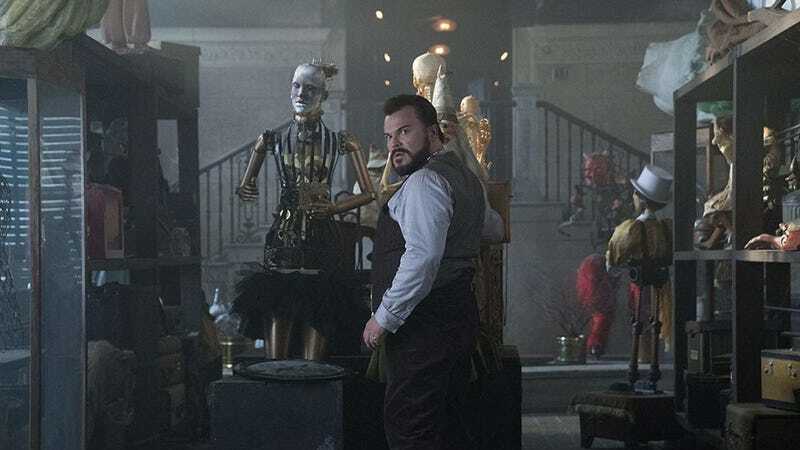 Jack Black stars in Eli Roth’s The House With a Clock in Its Walls. “I’ve been looking to do a movie like this for a long time,” Eli Roth told io9 in Los Angeles recently. Thanks to films like Hostel and Cabin Fever, the director’s name has long been synonymous with gory, intense, R-rated horror. That’s why seeing his name on the PG-rated family film The House With a Clock in Its Walls initially seems so surprising. Most kid-targeted movies these days are animated, or they’re PG-13 sci-fi or superhero movies. Roth wanted to make a movie like the ones he grew up watching: Time Bandits, The Dark Crystal, Dragonslayer, Labyrinth. So, he was delighted when producer Brad Fischer, with whom he was working on another project, acquired the rights to a 12-book fantasy series written by John Bellairs that starts with The House With a Clock in Its Walls. Roth saw it as exactly the kind of movie he was looking for, a movie like Raiders of the Lost Ark, Gremlins, E.T. and Poltergeist, which he cites as his “seminal theater-going experiences.” And those films all have one thing in common: They were produced by Steven Spielberg’s company Amblin, which is the same company producing The House With a Clock In Its Walls. That link really got Roth fired up to take what is, in his mind, the next step in his career. Director Eli Roth with The House With the Clock in Its Walls’ Kyle MacLachlan. Even though there’s a strong precedent for this kind of directorial leap, Roth had an extra step up on his predecessors. Though he’s not officially a producer on the film, Steven Spielberg was heavily involved and had many conversations with Roth, which the director found invaluable to making the film they both wanted to see. These pumpkins are the perfect example of scary, but not too scary. “Steven Spielberg sat me down and said, ‘You have to make it scary,’” Roth explains. “And I said ‘Okay, how scary can it be?’ ‘Oh make it scary,’ he said.” But this is Eli Roth, a man who admits to being out of body parts to chop off in his films. So this time, instead of chopping limbs, he’s chopping pumpkins. Instead of stalking young tourists, stop-motion automatons stalk witches. But even with those fantastic elements, there is one thing these scenes have in common with gory, R-rated scares. Owen Vaccaro is the young star of The House With a Clock in Its Walls. It’s Roth’s hope, if he did nail it, that The House With a Clock In its Walls will be a gateway drug to young people—a film adults can safely, confidently show them which gets them interested in other scary movies. That movie could very well end up being The House With a Clock In Its Walls. It’s in theaters today.